The Query Structure Tree represents the query structure in compact tree-like form. By using it, you can jump to any Union, Sub-query, Derived table or CTE and to any part of the query with a single mouse click. This feature is extremely useful in case of complex SQL queries. By setting the appropriate component's options you can set up the tree to hide unnecessary nodes. 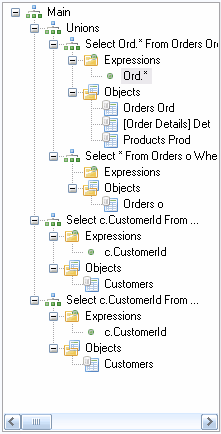 For example, you can hide Objects and/or Expressions nodes and show only sub-queries structure of the query.